« Gothamburgh n’at. Here be spoilers. Just wanted to share. Got this last month. I’ve loved Batman (even w/ the crappy Kilmer and Clooney tries) for just about ever and when it came to the Burgh, commemoration was needed. It’s the inside of my left ankle. 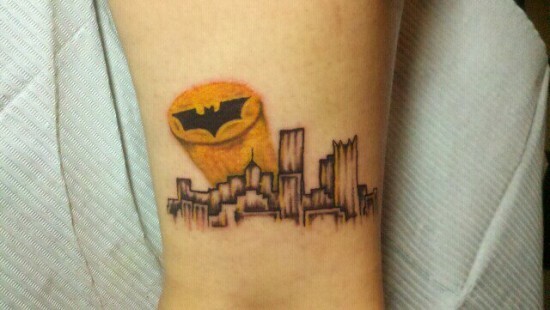 Look, the black and gold batsignal! Good thing for Angela that the Mellon Arena isn’t in her skyline. The skyline doesn’t correct, does it? No US Steel (UPMC) building? That will look so cool with age spots. Whew….now I don’t feel so bad about my ‘Striking Distance’ tattoo I got back in the day. of course, if it were a tramp stamp…. Luckily for those “ever so critical” folks out there, you’re not the one with the tattoo, huh? I’ve learned in my years of having them (first one when I was 18…at 12 total now) that those who don’t “get it” aren’t really worth listening to when they critique yours. If a tattoo makes someone happy, it makes someone happy, what’s your problem? If they liked it enough to ink it to their body, they’ll prob still like it when they’re a senile old coot. For all you know this girl is brilliant and has a PhD. And no “O” it “doesn’t” correct. The skyline was an artistic rendition and is not either perfect or to scale. It had to fit the area. Oh yeah, and re: the owner of said tattoo, she’s done with all her PhD coursework, has a 3.9 GPA, and takes comp exams next month. Perhaps her dissertation should focus on tattoo acceptance in the educational community, as she’s also a successful secondary teacher w/ 9 years experience.